For the most part, having a 401(k) investment is pretty simple, especially if it’s offered through your company. You let your company know what percentage (or what dollar amount) you’d like to invest, and it’s automatically withdrawn from your paycheck and put into your 401(k). The money gets divided into your preselected investments and presto, you’ve invested once again! Like I said, simple. That’s why it’s the first order of operation for retirement. But there are plenty of mistakes that could be made with your 401(k). Do your best to avoid these. Within your 401(k), you have plenty of options to choose from. You most likely have the chance to invest in small-cap, large-cap, growth, foreign, and some other funds that are quite stable and consistent. If you are young, you might be tempted to base your decision on the historical earning of each fund and choose the one that has returned the highest percent. While mutual funds are technically a grouping of many different stocks, this is not an effective way to diversify your money. Be sure to choose at least six or seven funds and choose from four or five different segments of your 401(k) plan. Did you know that each fund within your 401(k) has fees that you have to pay each year or quarter? For the most part, these fees are your payment to the mutual fund manager and employees. Oftentimes, the fee is less than 2% and seems very small, but when your fund only increases by 6% in a year, that means that you effectively only earned 4%! Those “small” fees just took away 33% of your earnings! If you have the option of investing in index funds, I would strongly advise that you take a good look at them and consider putting some of them into your portfolio. While mutual funds are more carefully selected stocks by a well-educated manager and his cronies, sometimes the heightened fees just don’t make sense. Index funds are set up to model a particular index, like the S&P 500, and the value rises and falls with that fund (for the most part). The fees on these funds are ridiculously low (like, 0.09%) and will model the general market pretty well. So, if you aren’t trying desperately to beat the market (like many try and fail to do) and are content to earn along with the market, then these might be a great option for you. For a while, company matches were a thing of the past because of rough economic times, but for many companies, these matching contributions are making a comeback! If your 401(k) exists within your company and you’re receiving a company match, again, by all means, contribute! Let’s say that you earn $50,000 per year and your company matches 100% of your contributions up to 3%. If you contribute nothing, then guess how much they put into your account? Exactly $0. But, what if you invested 3% of your income? That means that you would put $1,500 into your 401(k) over the course of a year, and your company would match that! Meaning, they would also contribute $1,500. Do you realize that you no longer earn $50,000 a year? Nope, your company just gave you a $1,500 raise. With their contribution, it’s kind of like making $51,500 instead. If your company matches your investment, use it! I saved one of the biggest mistakes for last. I believe that far too many people are borrowing from their 401(k) account, and they think it’s a wise thing to do! First of all, this is your retirement money. For most 9–5 employees, this is their sole retirement investment. They don’t have an additional business or income from rental units. Nope, they’ve got this 401(k) and that’s it. Yet, they think that it’s a good idea to take money out of it. Anyway, enough of my ranting. Why do I think that this is a bad idea? If you’re under the age of 59.5 years old, you’re going to get charged the 10% penalty for withdrawing money from your investment early. There are very few cases where you can avoid paying this penalty, so just plan on it. When you pull your money out of your investment, you’re no longer earning any returns on it. This doesn’t seem like a big deal in the short-term, but what if you calculated the compounded earnings over the next 40 years? What only seemed like $100 is actually thousands of dollars in the long-term. If you happen to quit your job, get laid off, or get fired while you’re taking that loan out on your 401(k), the money is due back into your account immediately. This is a huge risk since we both know that you don’t have the money to put back in there. After all, you wouldn’t have needed the loan if you had the money in the first place! No matter who you are or what you know, you cannot predict the market. It will go up and down without much of a warning. I know of quite a number of people that stop putting money into their 401(k) when the market is down because they are discouraged at the money they lost. But, this is exactly the right time to invest your money! The market is selling at a discount and will most likely rise. Instead of halting your contributions, it’s best to just be consistent and continue to contribute regardless of the market. Remember, you’re investing for the long-term. 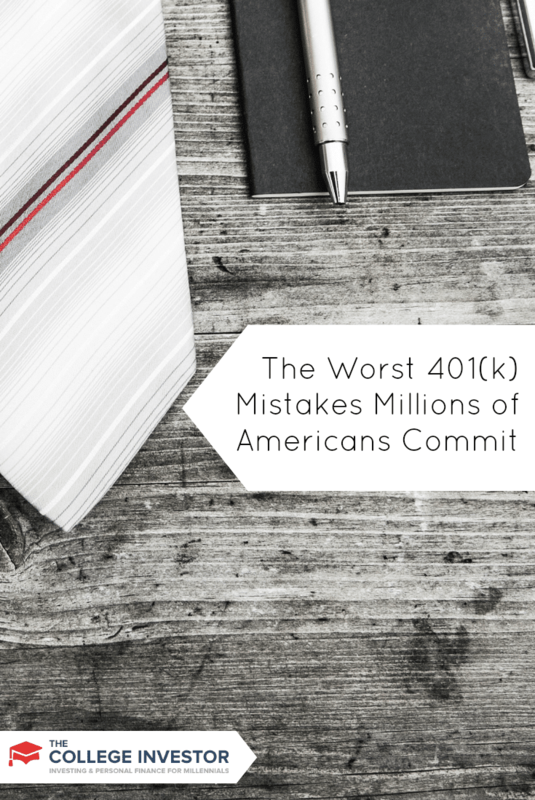 Can you think of any other 401(k) mistakes that we can add to the list? #3 is one of the worst in my mind. You’re giving up a free 100% return on your money by not getting the match! I don’t understand how people pass it up! I agree with this – free money is free money. You’re giving yourself a pay CUT not to participate. Good points! I would add the obvious, not participating is the biggest mistake. Hahaha – very true. Totally forget the most important step of actually doing a 401k! I’m lucky my employer added Vanguard institutional funds shortly after I joined. This makes my fund fees really low! Score! You know, I’ve heard more employers are making it part of the on-boarding process, but I think most employers still don’t force employees to participate. For example, mine doesn’t – they offer it, but don’t really do much more beyond having a poster in the breakroom. I think making employees opt-out rather than opt-in would be a much better solution. Good article Robert, those are all big mistakes. Even when companies force employees to opt-out (as opposed to leaving them to follow up on the poster in the breakroom…) they only put you in at 3% or something. It’s a lot better than nothing, but it might not get the full match and is probably not enough to fund a decent retirement. I think you’re right: it’s probably better than opt-in but the best thing to do is proactively enroll and save what you need to save. #2 is most important in my opinion. I feel that a funds expense ratio should be a large part of the decision on whether to invest in the fund. We often don’t have the best 401k choices as our employers pick the program, but we can at least take advantage of the company match in a fund which complements our desired asset allocation, and has a low expense ratio (preferrably no more than 0.15%). Those definitely sound like mistakes to avoid. You would think people would always invest at least enough to get the company match. If I ever get a job where I have a 401k, I plan to max it out. I don’t get a company match. We did for a while but they cut it back during the peak of the recession and so far have made no moves to restore it. I’ve often wondered whether I should be contributing to a Roth IRA instead. I’m pretty on top of my retirement savings. I’m always looking for ways to diversify. My company doesn’t offer a match, but I do contribute to the pension that it offers. I would add ignoring it to the list. My employer automatically enrolls people in the guaranteed fund. Right now that interest is less than 1%! Just leaving your money to sit and do nothing in that fund is a huge mistake.